Timbercare Exterior Hybrid Solid Stain with its alkyd fortified acrylic formula is a top quality self priming and sealer made of an alkyd and acrylic latex blend. This Hybrid blend offering the superior penetration and adhesion properties of an oil based primer and the long lasting durability of a 100% acrylic. 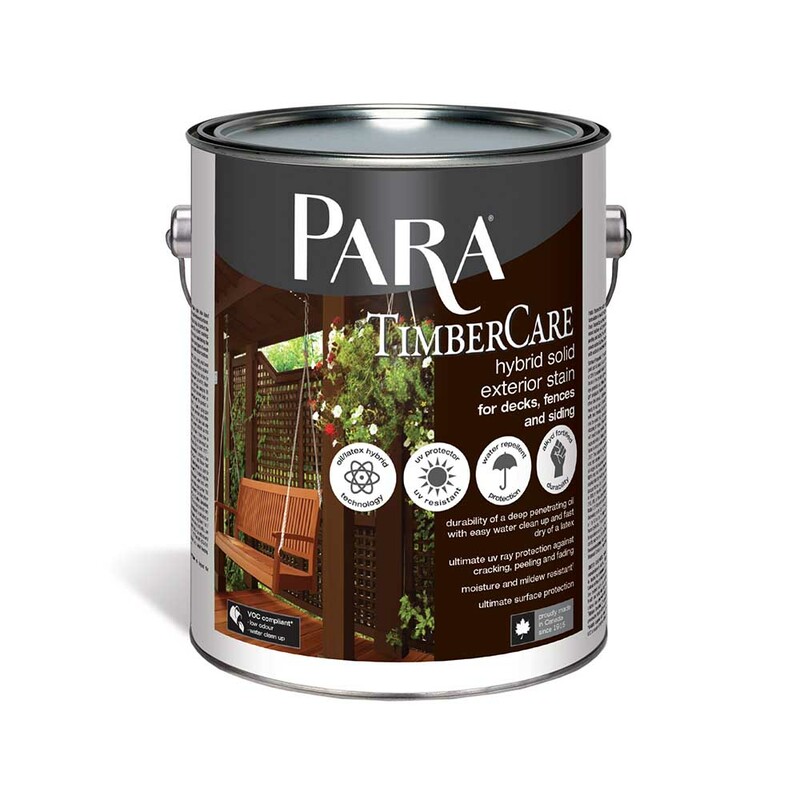 Protects and beautifies exterior new wood, weathered wood or previously painted or stained wood surfaces. Recommended for wood siding, fences, trim, decks and outside furniture. Before applying the product, wait 48 hours after rainfall or high pressure cleaning. The wood must have between 12 to 18% moisture content. Apply the product along the grain of the wood. If you use a roller, immediately smooth the surface with a paintbrush. To avoid lapping, only coat a few boards at a time. Generously saturate the ends of the boards. Apply two coats to achieve optimum performance, and comply with the prescribed drying time before covering. If second coat is not applied within 5 days after the first coat; please sand surface lightly with 150-180 grit sandpaper prior to applying second coat of stain. Let surface dry completely before walking on it. Extend drying time in case of heavy rain, cooler temperatures and high humidity. Wait 48 hours before resuming normal traffic, 5 to 7 days before replacing furniture on the deck and 14 days before cleaning the surface with a non-abrasive detergent and water.